Dinosaur Comics - October 23rd, 2008 - awesome fun times! October 23rd, 2008: I hope you all enjoyed guest week! Now it is over and you are stuck with just me. I - I need to find a better way of saying that? Hey check it out! 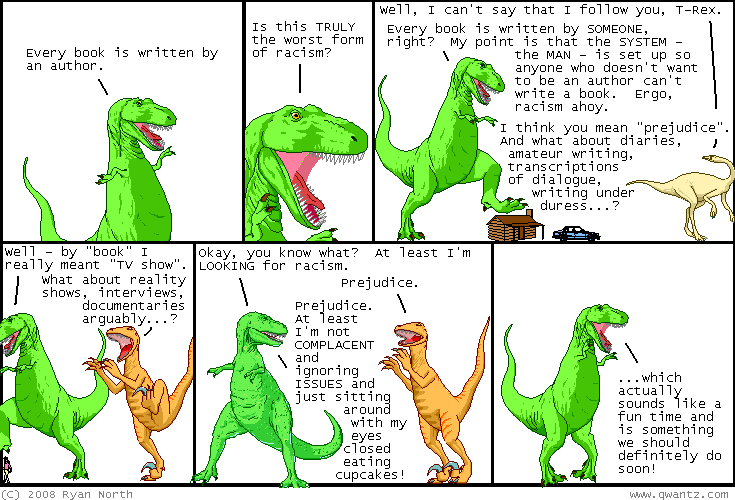 The Dinosaur Comics distributed computing team has just broken the 400-year barrier. That means we've done, together, over 400 years worth of computing towards curing disease. We are basically pretty excellent dudes and ladies I think! You can sign up here if you want to contribute your computer's unused processing time towards curing disease. Our team is the 13th biggest on the network, beating out the formerly-proud nations of France, Russia, and Canada.